Back when this tale was announced, Dilman was interviewed and after reading that interview I was very interested to read what he had written; while AfroSF had proved that the continent of Africa has great SF-storytellers, it also went a long way to showing how these storytellers flavoured their tales with cultural and mythological aspects unique to Africa – and I expected the same thing from Dilman. The tale follows a tribe during their long search for a new home; they lost a conflict with a rival tribe and had to give up their home, which forced them into a long journey, taxing not only their bodies but also testing the tribe’s resolve. Eventually, they find an idyllic place, but this is when their troubles really begin, setting up not only a conflict that could ultimately destroy the tribe but also drive deep wedges between its people. The tale is told in a style that most readers will find strange, or at the very least, different, to what they’ve encountered before.It has the flavour of a fable, or a story passed down through the generations with practically no alterations made to its rhythms and structure, so it isn’t told in a style that readers may consider ‘modern’, but I didn’t have any problems with it. In fact, if this tale had been written in any other style it would probably have come across as contrived, and the tale would have suffered for it. In terms of world-building the reader is shown glimpses of the tribe’s culture and beliefs – there’s enough to keep it interesting, though a particular type of creature in the tale might strike the reader as being out of place, or at the very least something that that Dilman used to try and bridge the gap between the cultures he grew up investigating and those of readers on continents other than Africa. 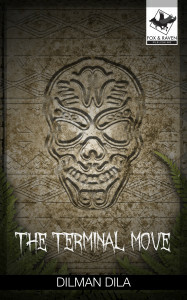 To order you Kindle-copies of ‘The Terminal Move’, click here for Amazon US and here for Amazon UK, and check out ‘Son of Suns’, the story’s awesome accompanying soundtrack, over on SoundCloud. 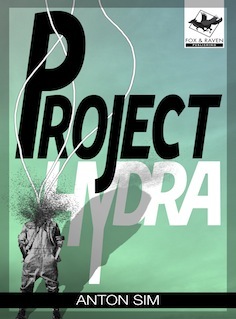 ‘Project Hydra’ is definitely one of the most original and disturbing tales I’ve read in a long time. In this tale, the reader is introduced to a group of co-workers who have to deal with a new and mysterious project initiated by their superiors – the ‘project’ of the title. How each individual worker deals with the questions raised by this new workplace phenomenon, and how they react when it is revealed, is what this tale is all about – and it’s an awesome play on the term, ‘Hydra’. It’s a memorable and chilling tale, and I’m definitely looking forward to more from Anton Sim. In this debut anthology of speculative fiction short stories, Fox & Raven Publishing presents a smorgasbord of delectable tales. In an eclectic mix of horror, fantasy, dystopian dreampunk and all-too-real thrillers, ravensmoot exhibits some of the best new writing in the genre. With a cartel of South African, Ugandan, British and American writers, ravensmoot promises to delight readers looking for powerful writing that isn’t afraid to push the boundaries of their respective genres. 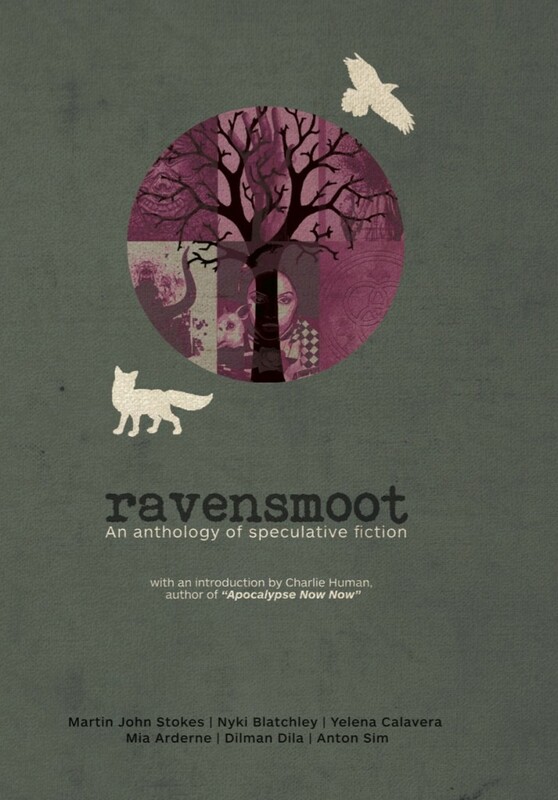 We are very happy to announce that ravensmoot will be available as a print anthology in select bookstores across the country before Christmas! And yes, that makes this the first Fox & Raven print publication, so we’re all warm and fuzzy about that. With the introduction written by Charlie Human, acclaimed author of Apocalypse Now Now, and featuring six powerful writers, we just know you’re gonna love this. The anthology will be available before Christmas as a limited edition paperback (with the great, eye-catching cover you see above), with the eBook edition becoming available towards the end of January 2014. I’m back with the latest short story / novella offering from Fox and Raven Publishing – Mia Arderne’s ‘Pigs in Golfs‘. Back when I read Mia’s story, ‘Brandy City‘ (in AfroSF – Science Fiction by African Writers) I knew that Ivor Hartmann had found a storyteller with loads of talent and balls, and Mia once again proves this with ‘Pigs in Golfs’. On one hand, it’s a love story, showing us a husband and wife and giving us a snapshot of their lives together. They are sensual and driven, satisfied and happy, and unafraid of their appetites. She is hiding something from him, something important yet unproven, and he indulges in a dangerous hobby, dodging not only death but also the Law. On the other hand this is the tale of a despicable killer, a murderer of twisted appetites possessed of an even more twisted worldview. He is so sick that he could very well be an ‘it’, though Mia manages to beautifully straddle the line between monster and madman with a creepy and brilliant balancing act – there are hectic scenes in this tale, scenes that will make you flinch and grimace and you may, perhaps, find yourself wanting to set down your eReader. You won’t, though. Because it’s when these three people collide (and the reader can see the collision coming, like being stuck in traffic and seeing an accident unfold in dreadful slow motion) that the tale is at its most visceral and shocking. I was left silent and stunned as the events played out, and then got another kick in the stomach for good measure at the tale’s end. I’m seriously looking forward to more from Mia – she’s the kind of storyteller that is unafraid and the kind of writer that knows how to use words to pull, pinch, torture, sicken and elicit smiles. An amazing talent! 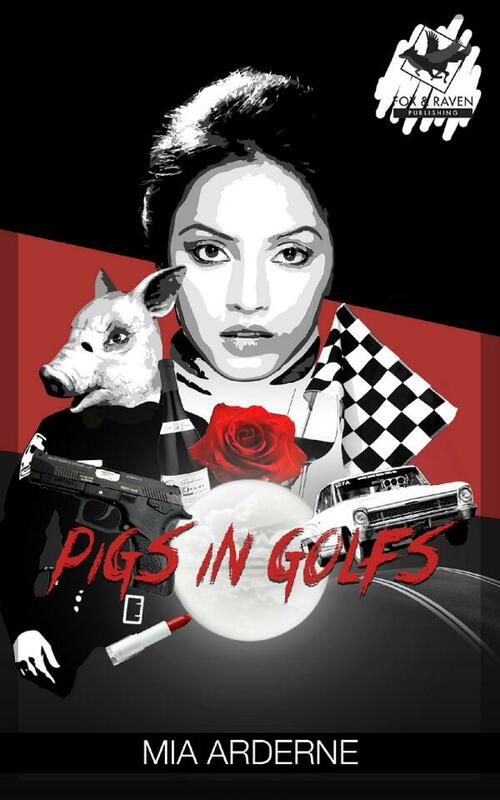 Check out the awesome soundtrack to ‘Pigs in Golfs‘, composed and created by Adolf De Beer, at Fox and Raven’s SoundCloud stream – it fits in beautifully (and creepily) with the tale! What do you do when your own dreams hunt you? You hunt them back. Johannesburg has been destroyed. It is a dead city – torn asunder by the horrors, the nightmares, of its inhabitants. And the nightmares are roaming free. Shelby Maddox and her sister Lara are the only survivors, fighting for their lives, scavenging the ruins of this goldmine metropolis for scraps of food. With the appearance of Luke, a Dreamer with mind-bending powers, everything changes. Shelby embarks on a journey to save her sister, to save herself – and to conquer her demons. What first dragged my attention to this tale was the awesome cover art – it put me in mind of a Rorschach ink-blot test gone haywire and psychotic, and I was immediately interested (check out the cover at the end of the post). The story centres on Shelby, a girl living in the shattered remains of the African metropolis, with her younger sister. Life is beyond difficult – just leaving the relative safety of their refuge could lead to serious injury or even death. Yelena does a great job of describing the ruins of the city – the streets are empty, the buildings are desolate and sad, and wild animals roam are slowly taking back the concrete-and-glass spaces. Shelby is a great character, given to philosophical musings and deep insights, but she’s also capable and dangerous – she has learned the hard way what to do to survive, and has also had to take the role of guardian for her sister. But things change when Shelby save a very personal nightmare from another human, Luke – what is further revealed about the world in which these remnants of humanity live, through as Shelby and Luke’s fate unfold, shows Yelena’s skill at building a world with layers of menace and beauty. Looking forward to more from this talented writer! 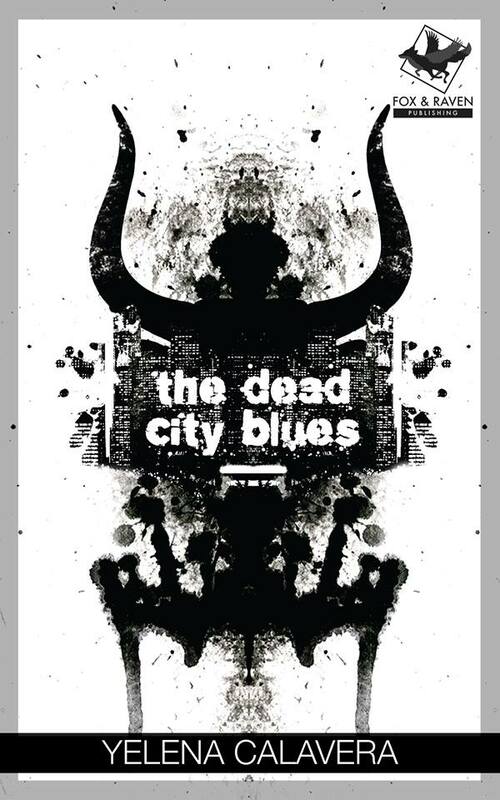 For more info about Yelena visit her blog here; to order your e-copies of ‘The Dead City Blues‘ click here for Amazon US and here for Amazon UK. I’m (finally) back with my second review of the short stories published by Fox and Raven Publishing, and this time the focus in the Epic Fantasy story, ‘The Triarchy’s Emissary’ by Nyki Blatchley. “An Empire in ruin. The power of the gods corrupted. Nations shattered. Novesh, once the Empress of Shebal, must now carve out her political career in Faiz – a city tearing at the seams as different factions vie for its control. From her fortified seaside mansion, she silently orchestrates the rebirth of the Empire. Her Empire. But there are those who would see her fail – those who would pay great amounts to topple the would-be Empress. The first short story published by Fox and Raven was a gripping, horrific tale (reviewed here), and this tale by Blatchely is a great example of Epic Fantasy. The story opens with Edralit, a mysterious visitor to Faiz – she’s from the Highlands, which makes her arrival in Faiz an event that is noticed by many. Novesh is an empress without an empire, struggling to marshal what support she can gather for her cause while suffering nightmares regarding the events that saw her Empire collapse. From the beginning I was curious about Edralit – she’s capable, intelligent and wary, trying to hide a past that would lead most people to giving her entirely too much attention. From her opening conversations with a serving girl right through to the tale’s climax Edralit is compelling and interesting, a great counter-character to Novesh. Novesh plainly struggles with the trappings of her station and birth, and her need to ensure the rebirth of her empire brings a constant, sad tension her scenes – her strength and resolve come through wonderfully, as does her political acumen. The back-story of this tale raises some very interesting questions that I hope Nyki will deal with in a full-length novel – the settings (the places we as the reader visit and those only mentioned) really made me curious and world-building was interesting and imaginative, with a hint of the magic which exists in this world. Nyki has a great eye for scene-detail and he handles character-interaction well – the action-oriented scenes are also thrilling, adding the physical element to the tale and also mixing in great tension. 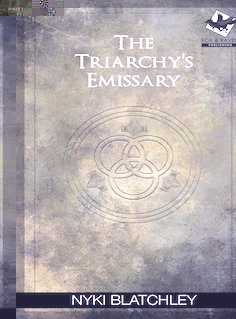 To order your e-copies of ‘The Triarchy’s Emissary’, click here for Amazon US and here for Amazon UK. Follow this this link to Nyki’s website for more info on his work, check him out on Twitter here, and click here for an interview with Nyki. 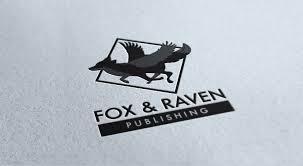 Also, check out Fox and Raven Publishing for more information about previously published stories as well as upcoming publications! You can get more info at this link, and at Fox and Raven’s Facebook page, but what you need to know is that Fox and Raven are a new independent publisher, based in Cape Town, South Africa, who are focusing on bringing readers excellent new writers of Science Fiction and Fantasy, as well as stories that could be considered Urban Fantasy and Horror. Martin first came to my attention when he was published in the first Science Fiction Anthology featuring African Writers, AfroSF (reviewed here), and with Passing Visions Martin shows his versatility as a storyteller and writer who doesn’t allow himself to be caged by a specific genre. 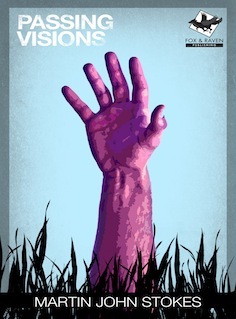 Passing Visions is about a psychologist is pulled into the sadness and horror of his patient’s life. James is trying to be a normal teenager, but and encounter with the school bully has turned his life upside down. I won’t reveal just what happened (the cover of the eBook is clue enough), but I will go into why I thought this was a brilliant, captivating read. And pretty damned unsettling, too. Like every other teenager in high school James is searching – for himself, for balance, for hints of who he wants to (or might) when he becomes an adult. He struggles with fitting in and conversely, with standing out. Indie is a psychologist who is trying to balance his career (or calling) with the stress of an impending divorce. He feels that he knows what life is about, what and who he is; his entire world is changed when James enters his practice. These two characters play off each other wonderfully – the majority of the tale is told from James’ point of view, so the reader gets to know James quite deeply, but even so, Indie’s strength as a character shines through; he’s not James’ opposite but a person in his own right, not a foil but an explorer who is approaching James and the reason he has come to see Indie from a clinical, logical direction. James at the beginning of the tale is the person who’s gone through everything and we get snapshots of who he was, or the person who is now hiding, as he tells his tale. With Indie we witness the fall into darkness and madness, vicariously listening as James’ story unfolds, both imagining Indie’s reaction and living it through our own thoughts and responses. Martin manages to begin the story at an even, gradual pace, introducing not only the two characters but the room in which the tale occurs – as the tale progresses he takes us to James’ high school, home and garden, and even though the pace remains even and measured throughout -this isn’t an action adventure or a thriller- the psychological onslaught begins, at first hardly noticeable but gradually becoming more powerful. And this is before the horror of what is happening really takes hold. By the time it does, I’m sure the reader – as I was- will be held fast, unable to stop reading. It is, as they say, too late. Martin also writes with a beautiful and enviable control, stringing sentences together in such a way that scenes take shape and characters take life with what seems to be no effort – and there are so many memorable lines in this story! Memorable and unsettling, both. This is definitely a story that will remain with me for a long, long time. It shows that Martin can weave an incredible, memorable tale with realistic characters that make the reader wonder and flinch and grimace and shudder – I can’t help thinking that he’ll be giving many readers many, many sleepless nights! An excellent tale – psychologically disturbing, emotionally powerful and creepy as hell!